Literacy stations, centers, work stations - whatever you call them - are a staple in many elementary classrooms these days. While they only last an hour or so in most classrooms, they sure can pack a big punch if done well. Stations include all those independent literacy activities the kids wreck work on while the teacher meets with small groups for guided reading. So, all we have to do is place all the kids in the appropriate guided reading groups, set up and stock anywhere from 5 - 10 stations, teach all the procedures (so they don't wreck stuff), and organize a rotation schedule. Geez, just writing that made me short of breath. It's a HUGE task that takes weeks and weeks to get underway and additional time every single day to maintain. It's got to be organized and well structured in order to be effective for the class and not too time consuming for the teacher. One way to streamline the process is to have an effective station/group rotation system in place. My school uses the Debbie Diller model for literacy work stations and I LOVE so much of what she shares. The one sticking point for me is the stations rotation schedule. I just don't like to move all those cards around a pocket chart. I don't know what it is - I always dreaded it. So I stopped. But, how to organize all my little critters and keep them on task? Back to the wheel! I immediately loved the way she organized group rotations. All students are in two groups - a guided reading group (homogeneous) and a work station group (heterogeneous), so guided reading groups do not have the same kids as work station groups. Here's how it looks in my class. I have about 20 students. I like to have 2 students in each work station group so I need to have 10 stations. I pair a 'high' student with a 'middle' student or a 'middle' student with a 'low' student so there is an ability difference but the difference is not too wide. This way, students can help each other and they get to work with different kids than they work with in guided reading groups. 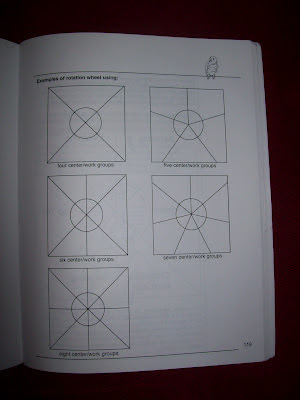 I use Pavelka's handy dandy rotation wheel to make it all work. The outer wheel contains the stations and the inner wheel the names of the students - this wheel is attached with a brad and turns. After each guided reading group, a student turns the center yellow wheel clockwise one block and the kids move to the next station. Students will complete 1 to 3 stations each day. No, not every kid goes to every station a certain number of times every week. But that's okay. Everyone is getting either a small group guided reading lesson or focused literacy station activities during the reading hour. Just because they are not doing the same thing does not mean they are not getting what they need. The best part? I don't have to change any cards in a pocket chart, the kids can rotate the wheel, and everyone knows what to do so no time is lost. The center wheel is easily changed if necessary and the outer wheel stations are attached with sticky tape so they can easily be changed, too. I brought my wheel home this summer to pretty it up a bit and possibly make the outer part round - we'll see! Let me know if any of you use this method and have any suggestions! 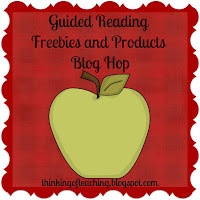 Join in with this blog hop to get lots more guided reading ideas! Just a reminder, you will be featured this Tuesday on the New Teacher Blog Tuesday! Thanks so much for posting this! Being new to literacy centers I wanted a quick and simple way to manage them and I think this will be great in my room! Thanks for sharing! Thanks for linking up with the blog hope and posting about it on your blog. I really appreciate it and love your freebie. I am just so glad to see so many teachers embracing guided reading! My school has done small group reading for many years so I feel like it's just a natural part of the day. But, I am amazed at how many teachers I have come across out there in the world who just follow that basal and have no idea how to meet individual needs. So, thanks to you for spreading the word and helping us all learn more about a very important part of our students' day! Absolutely! I have had so much trouble with that Google Docs link! In a couple of days I will post specific directions on how to make and use the wheel, and a set of templates for the inner wheel. In the meantime, I will e-mail you the templates. 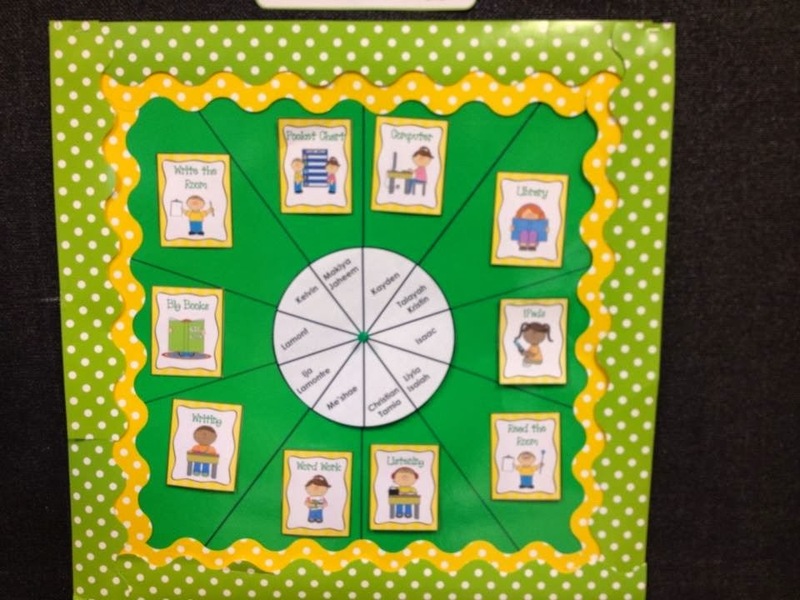 I hope you like using the wheel - I think I will never go back to a pocket chart! Could I please ask if you pull students for guided reading how does this effect students left on their own? How do you deal with this? I ABSOLUTELY love the wheel! I have the same dread about rotating all of those station cards every day! I would love to use your idea in my classroom, but I'm wondering if you can share more information about how you work Guided Reading groups in there. Do you have a separate rotation schedule for that? I'm just not sure how to schedule GS groups and the station rotations so that they are easy for the kids (and me) to follow, doesn't take away from their rotation time, and allows me to see everyone that I need to see as often as I need to see them. Thanks so much for posting all that you have shared so far! Could you tell us what each of your rotations entail? I'll need a similar amount of groups and am struggling to come up with enough independent ideas!